"Bearing Fruits" Borough Plan. Download the PDF version; or go to SBC's "interactive" map (I found this difficult to use). Andrew Bowles' Monthly Letter - September 2018: Listing visits and official attendance over that month. Back Number of June 2018 on housing and planning issues. 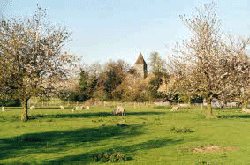 Lynsted Parish Council agendas and Minutes - decisions are made on your behalf. Make sure you are aware of changes, policies, decisions and services by visiting the Parish Council website regularly.....avoid any surprises. This table predicts increases in diseases coming from PM2.5 (excluding NOx). Swale Borough Council AQMAs only measure NOx, so they miss the increases in harm to local residents from other products of friction and combustion. SBC also measures NOx above head height, so not really helpful or accurate reflection of the real world for residents. (Source: Public Health England Modelling software, 2018) - "Air pollution: a tool to estimate healthcare costs 2018" - you can scroll to the bottom of that page to download and run the tool yourself if you like. This table shows PM2.5 pollution excluding Nitrogen Dioxide. Nitrogen Dioxide levels will now remain fairly stable in Swale over the next ten years. Curiously, NOx will lead to increased admissions with diabetes over the whole period! The numbers are for the whole Swale Borough. However, logic tells us that most harm will hit places with the worst pollution - along busy roads with the greatest concentration of pollution (the AQMA areas). The figures may include a worsening of symptoms for those with existing illness. Traffic Flow: Understanding how and why queues grow. Visit our Traffic Page to learn more about traffic burdens on the A2 and the changes in types of vehicles between 2000-2017. 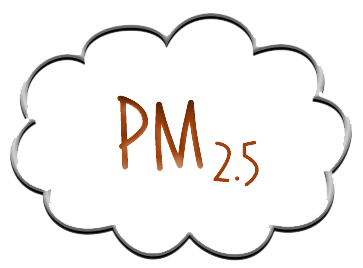 So, what is included in "PM2.5"? DEFRA's Air Quality Expert Group, 2012 - read 203-page PDF. Significantly, in 2012, this report asked for at least five years worth of data to improve understanding PM2.5 pollution products and sources. Today (2018), a clearer picture is emerging. nitrate (NOx), sulphate and organics are major components. polycyclic aromatic hydrocarbons - more than 100 chemicals found in smoking cigarettes, breathing secondhand smoke, vehicle exhaust, fumes from asphalt, emissions from fossil fuels, fires ....... and volcanoes! benzene - from vehicle fuels, rubber compounds. iron-rich dusts are attributed to non-exhaust traffic emissions - friction products. calcium salts are attributed to construction/demolition dust and wind-blown soil. sodium chloride to sea salt (and resuspended de-icing salt). Elemental carbon relates to primary combustion. Organic carbon (organics, soot), both from combustion and natural sources. lead - persistent pollutant in our environment; suspended lead is more likely from polluted land since leaded petrol is a thing of the past; lead accumulates in the body. "there is understood to be no safe threshold below which no adverse effects would be anticipated". The bulk of historic research into "particulate matter as pollution" has not differentiated between PM10 and the smaller PM2.5 particles. There is a growing realisation that when the finer particles and compounds interact with people, they penetrated more deeply and more easily accumulate in our organs. Why are PM2.5 products dangerous? penetrate more deeply into our lungs and across our membranes to find their way into our blood and organs. can be lifted from surfaces by the lightest winds to return to the air we breath. can blow over great distances. e.g. industry (including quarrying and excavation, shipping, aircraft, continental sources (fires, vehicles, volcanoes), etc. The most vulnerable to pollution are the very young and the older members of our communities. But all of us are harmed by all pollution levels - making existing conditions worse, challenging our immune systems, potentially leading to more serious illness. Guardian article - "2017 - Early 40 million people live in UK areas with illegal air pollution"
Guardian article - "2017 - Diesel cars emit 10 times more toxic pollution than trucks and buses, data shows"
USA Government website on air pollution measurement. BRICKEARTH in BARROW GREEN FARM - 760,000 tonnes extraction 30,000 tons per annum for 25 years. KCC Highways and Transportation Response (dated 20th March; Posted 24th May). SITTINGBOURNE 11,250: South & East of Sittingbourne: 17/506492/ENVSCR - Possible "Garden Town".